Fernando Sanchez’s life was not unlike other veterans when he first served in the Marine Corps. He was in the military for four years, serving both in Iraq and Afghanistan, and sought to start a family when home. He had a child and a wife and was looking forward to providing for his family for a long time. Then one day, all of that changed. 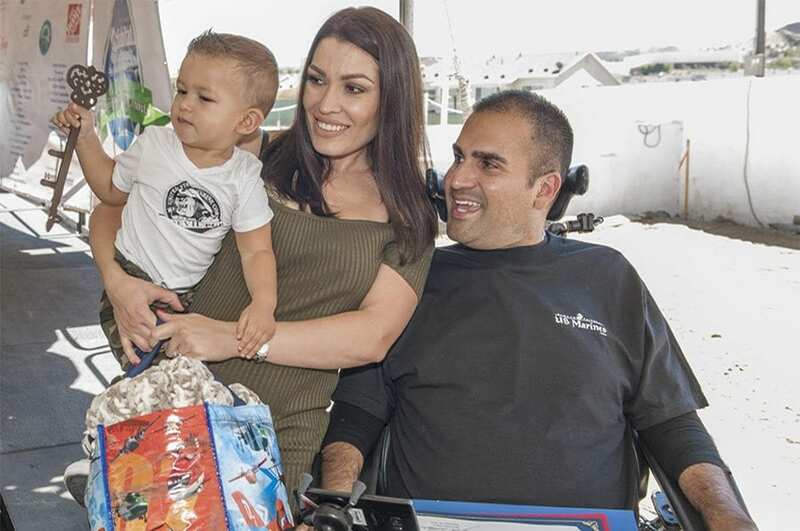 While at home, Sanchez was disabled in a motorcycle accident leaving him a quadriplegic. He was no longer able to work and providing a home for his family was impossible for him to accomplish. That is until his family applied to get a house with Habitat for Humanity that was building a community under the direction of Homes for Families. They were accepted and invited to join a neighborhood designed just for veterans to live together. That neighborhood is located just off of Centre Pointe Parkway in Santa Clarita. CalVet Secretary Vito Imbasciani, right, is with Fernando Sanchez and his family as they stand in front of the house Habitat for Humanity helped provide for him. “It just makes me so happy,” said Fernando Sanchez in September during a gathering where his family received ceremonial keys to their home. “(We) finally have our own home.” There was still one obstacle to cross after he received his home though. He needed a custom-made bathroom to fit his large wheel chair that is designed for his tall stature. Everyone in the program banded together to raise $3,000 by holding a raffle for a Kitchenaid BBQ station. Now, Sanchez can take a shower in a place he can call home. He is now part of a community of 78 other veterans who understand each other through their shared experiences in the military.